Over the weekend, my most recent batch of CNR boxcar builds took a step closer to entering service on the layout. I lettered the three cars using decals from Black Cat Publishing. – A coat of clear gloss to protect the lettering and blend the decals into the paint. – Replace the wheel sets: I leave the kit-supplied sets in the trucks while painting to protect the bearing surfaces and give me something to rest the car on, then substitute NWSL wheels before the cars go into service. – Replace the couplers: These kits came to me pre-built although I re-detailed them. Two of the three had couplers in place, but I prefer to start with fresh couplers in situations like this. – Add BTS air hoses/glad hands. That’s not a daunting list and it shouldn’t take me too long to complete – at which point I’ll have five of these boxcars in service on the layout. And that will really change the appearance of operating sessions. This entry was posted in CNR boxcars, equipment by Trevor. Bookmark the permalink. Hey check out my new blog. It’s a replacement for my first blog which I can not access an more because Google changed the way you log in and they wiped out my account on google as well. I’m going to like this one better me thinks. Good to hear from you Chester! I’ll update my link to your blog next time I’m at my computer. I’ve now updated that link, Chester. Good luck with the new blog – I look forward to reading regular progress updates! Your little math problems assume I can add and subtract. Why are you building such a large fleet of one class of car. Seem like you would want more variety. Jared: there’s definitely something to be said about having a unified fleet; for a realistic fleet you should have a core of cars from common home-road series; thus having several nearly identical cars from the same series, plus other cars mixed in, goes a long ways towards a realistic fleet. In this post, the three cars are identical from the same series (although even here Trevor’s introduced variety by painting one with the older white herald), but you can tell from other posts on this blog he has other CN boxcars from other series with small detail differences, plus wooden cars, and double door cars under construction. It would be very un-realistic to have a roster that consists of a bunch of totally unique cars. In addition to Chris’ observations (thank you Chris!) I’ll add that this is Canada, eh? Remember that in the era I’m modelling, the CNR and CPR were huge nation-spanning systems – quite different from the situation on your side of the border. Most freight would have been carried by a single road, without interchange. 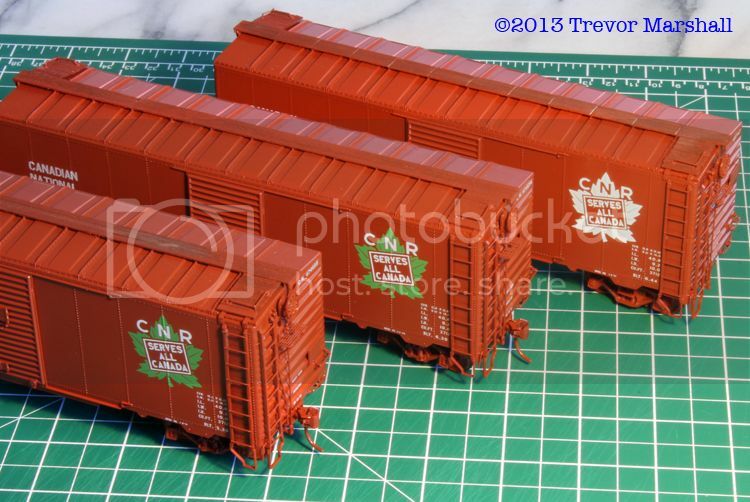 One reliable source suggests 75% of the boxcars on a mid-century Canadian layout should be home road boxcars. A distant second would be traffic exchanged between the two major railways. A distant third is cars from American roads. Most traffic would’ve been domestic. And of the foreign goods, the UK or other Commonwealth trading partners are more likely sources than the USA. Not only would most traffic in Canada be either from Canada, or from Commonwealth trading partners (and therefore arrive in Canada by ship then get transferred to a Canadian road’s boxcar), but I’m also modelling a tiny backwater on the CNR’s system. Therefore, every car that arrives on my branch is there because it’s delivering something to St. Williams or Port Rowan – or picking up a load from these places. If delivering, chances are slim that the load came from anywhere other than a place where it could’ve been loaded into a CNR boxcar. If it’s a load originating on my branch, it’s likely to be packed into a CNR car. This isn’t a hard and fast rule – I’ll list some exceptions in a further thought – but it’s a good guideline. A large percentage of the loads in and out would be dealt with through LCL – either in the baggage compartment of a passenger car, or in a boxcar assigned to the service. There is NO bridge traffic on my layout. Therefore, I can’t run foreign road cars through the layout from staging to staging, on the assumption that they’re headed somewhere else. That further restricts the variety of what can show up on the layout. The reality of S scale is there’s limited choice for rolling stock. One reason I will have so many CNR 10′-0″ steel 1937 AAR cars on the layout is that Pacific Rail Shops made a suitable plastic kit for this prototype, and decals are available from Black Cat. – CNR 36′ Dominion boxcar (the Fowler Patent): 1 on the layout, one in kit form. I’d like a couple more. This is a Ridgehill Scale Models resin kit. – CNR 40′ single sheathed car: 3 suitable stand-ins on the layout. This is an S Helper Service RTR car that I’ve detailed and painted. – CNR 40′ AAR 1937 steel boxcars (10′-0″): Like the cars in this post. I have two on the layout, three (these ones) almost ready to go, and two more in kit form. Pacific Rail Shops kits. – CNR 40′ double-door box: I have one on the bench. It’s an extensive modification of a PRS kit. – CNR 10′-6″ steel boxcars: I have one kit to build and am in the process of collecting a second one. Like the double-door boxcar, these will require extensive modifications to a PRS kit. So, that’s 15 cars in five varieties. Not too bad a representation of the CNR’s vast fleet. Looking through photos of the operation in Port Rowan, I have seen some foreign road cars in interesting service. To start, there’s a photo of the mixed arriving in Port Rowan with two hopper cars loaded with gravel. This isn’t too surprising – there was a large gravel quarry just up the way at Hagersville, Ontario. IIRC, it even supplied the CNR with ballast. What is surprising, though, is that the two loads are in Pennsylvania hopper cars. I’m confident the loads of stone were not sent from PRR territory, across an international border, when local supplies were so abundant. My best guess on this is that the CNR “borrowed” the cars to run a couple of loads down to Port Rowan. Another interesting photo shows a mixed train in the Lynn Valley with a Southern Pacific boxcar. It’s between locomotive and passenger equipment as the train makes its backing move to Port Dover, so it appears to be in LCL service. Other freight cars – in carload service – are coupled to the head of the locomotive on this move. Perhaps it’s not in LCL service – perhaps it’s being switched into a facing-point spur in the Port and there was no boxcar of LCL that day. Or perhaps it was borrowed. I don’t know. From a consist perspective, though, it’s definitely usual. With all of that said, I doubt I will model either of these examples on my layout. I’ll do better to model the typical – it’ll make for a more convincing story – and I already have enough odd-ball freight cars (including a B&O wagontop covered hopper and MILW horizontal rib boxcar). Those PRR hoppers would likely have brought loads of coal into Ontario, and caught captured for loading with stone on the return trip. That sort of thing was common, and indeed encouraged. Foreign cars could be routinely used for shipments heading in the same direction as home. These would actually be preferred to home road cars to make good use of empties. I thought that too – except that the Port Rowan branch isn’t on the way home. It’s the end of the line in nowhere. Anything headed to Port Rowan is going away from everywhere else. So the CNR must’ve “borrowed” the cars. I’m sure the PRR would not have approved. True but the gravel could be bound across the border, and the PRR hoppers simply more handy on that particular occasion than any CN cars. The short answer is yes to the gravel pit. The long answer is, this is evolving into a new posting, I think. I’ll work on one with maps, etc., to help explain the conundrum of the PRR hoppers. The overwhelming percentage of cars on the Central Vermont (and other CN US subsidiaries) was also quite overwhelming. In Sept 1955, exactly 1/2 of the boxcars that passed through White River Jct. were CN. That’s really interesting – I didn’t realize that but now that you’ve mentioned it, it certainly makes sense. I suspect a lot of those CNR cars were carrying goods between Montreal (Canada) and the port at New London CT? The contents would’ve been headed to (or coming from) overseas, and the cars would’ve been sealed by Customs since the contents were only to travel through the United States, and therefore US tariffs/duties/taxes would not apply. It appears from photos that any good boxcar could be used as a way car. But way cars tended to be cars recently shopped with doors that opened and closed easily. Nothing like fighting with a sticking door several times a trip! There are photos of baggage cars in use as way cars on CN, but the airbrake system on them would have had to have been set by car department staff to “direct release” rather than “graduated release” as used in passenger service. These cars are looking very nice. I’ll have to come by to see them in a few weeks. As an update, I sprayed the top coat of clear finish on these cars yesterday and I hope to weather them today.